Sun City offers world-class active adult living without breaking the bank, offering homes starting under $100k. As one of the top retirement destinations in the country, Arizona has a wide variety of active adult communities. These impressive developments often include homes in a range of sizes and prices to accommodate many different retirees. The team at 55 Places compiled the following list of the 10 most popular budget-friendly Arizona active adult communities based on visits from you. 1. Sun City – Sun City, AZ Sun City was the country’s first active adult community and it’s still one of the best. Since opening in 1960, this Del Webb community has developed into a sprawling resort-style oasis. It currently features seven recreation centers, 11 golf courses, 19 shopping centers and a wide range of amenities. 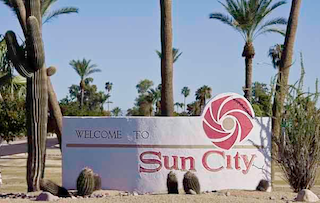 With over 26,000 homes, Sun City has fabulous options for nearly any budget. 2. Sun City West – Sun City West, AZ Just 2.5 miles from the original Sun City, Sun City West was built by Del Webb between 1978 and 1997. The development contains 16,900 homes, including many budget-friendly condo, attached home and single-family designs. There are also many impressive community amenities. Just a few highlights include four clubhouses, nine golf courses, 27 tennis courts and a 30-lane bowling alley. 3. Sun City Grand – Surprise, AZ Built between 1996 and 2004, Sun City Grand follows on the success of Del Webb’s Sun City and Sun City West communities. Sun City Grand is smaller than these predecessors, but its 9,802 homes offer many affordable options for homebuyers aged 45 or better. Along with its beautiful homes, the community also features three clubhouses, three 18-hole golf courses and an exciting line-up of amenities and activities. 4. Sun Lakes – Sun Lakes, AZ Sun Lakes is a beautiful 6,683-home development created by Robson Communities to appeal to active adults aged 40 or better. 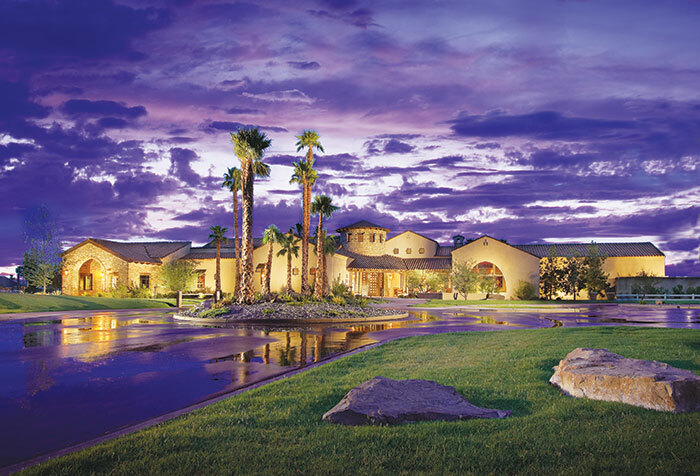 Just 24 miles from Downtown Phoenix, Sun Lakes provides impressive amenities including five spacious clubhouses, four 18-hole golf courses and three 9-hole golf courses. Homes in Sun Lakes are spread across five distinctive neighborhoods: Sun Lakes, Cottonwood, Palo Verde, Ironwood and Oakwood. 5. Province – Maricopa, AZ In Maricopa, Province is an attractive 55+ community built by Meritage Homes. Province opened in 2004, and homes are currently available on both a new construction and resale basis. Upon completion, Province will contain 2,217 affordable residences. The fabulous community amenities feature a 32,000 square-foot clubhouse, indoor and outdoor swimming pools, sports courts and 50 acres of scenic lakes. Robson Ranch offers magnificent active adult living combined with affordably priced ranch homes. 6. Robson Ranch – Eloy, AZ Halfway between Phoenix and Tucson, Robson Ranch is an amenity-rich community open to residents aged 40 or better. Homes at Robson Ranch are designed by Robson Communities with open floor plans and desirable upgrades. The community opened in 2005, with plans for approximately 4,600 homes in single-family and attached home designs. Residents enjoy an amenity-rich clubhouse, hobby and game rooms, swimming pools and sports courts. 7. Prescott Lakes – Prescott, AZ Diverse homes at Prescott Lakes meet the needs of many different active adult homebuyers. The community is just minutes from historic downtown Prescott and only a short drive from Flagstaff. Development began in 2001 and homebuyers can currently choose from available new construction or resale homes. Upon completion, Prescott Lakes will feature 1,300 homes as well as a spacious clubhouse, 18-hole golf course and various social and recreational activities. 8. Leisure World – Mesa, AZ Set in Mesa, Leisure World is just 20 minutes outside of the Phoenix metro area and in close proximity to the recreations at nearby Canyon Lake. Leisure World was built from 1972 to 1994 with an eye toward supporting the needs of many different active adults. A full-time recreation staff is available to help residents find activities that match their interests and exciting amenities make the community feel more like a resort. 9. Sunbird – Chandler, AZ Affordable homes and great amenities make Sunbird a fabulous option for homebuyers on a budget. With 1,631 homes, Sunbird is smaller than many of the communities in the Phoenix area, yet its collection of amenities include a sprawling 43,000 square-foot clubhouse, an 18-hole golf course, an outdoor swimming pool and sports courts for tennis and shuffleboard. 10. Ventana Lakes – Peoria, AZ Nestled in scenic Peoria, Ventana Lakes boasts a spacious clubhouse with a variety of resort-style indoor and outdoor amenities. The beautiful grounds also feature nine well-stocked fishing lakes, waterfalls, walking trails and docks for fishing or paddleboats. Affordable homes include single-family and patio home designs built from 1986 to 2002. With so many affordable options, Arizona active adult communities meet the needs of nearly any homebuyer.